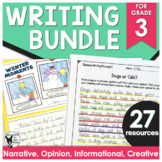 Also included in: 3rd Grade Language Arts Bundle, Standards Aligned Reading & Writing Projects! 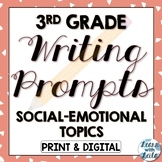 This file contains four pages of writing prompts targeted for third grade. These could be used for other grades and tweaked as needed to fit the needs of your students. Easy format to print, cut, and laminate. Great for writing centers or journal writing. Getting students to write can be a challenge. This list of 200 unique writing prompts for 3rd graders is sure to help your students come up with stories of their own. The list also includes ideas for writing poems. This fun writing prompt is aligned with standard 4 of the Common Core Standards for 3rd grade writing. Your 3rd graders will love creating their own personal snow scene and writing about their favorite winter activity. This packet includes 10 Narrative Prompts, 10 Opinion Prompts, and 10 Informative Prompts. This packet includes Social Studies standards as well with the informative writing prompts. 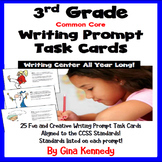 With a total of 30 different writing prompts this will be a great resource to use during your writing centers. 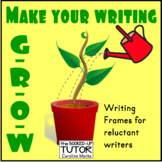 This resource includes 36 writing prompts. It is available in two different forms + Half sheets (2 per page) + Cards ( 6 per page) You can use these prompts to help students practice their writing, reading and reflections. +Laminate the cards, put them on a ring, and give one set to each student. These prompts will definitely keep your writer engaged, as they color, cut, paste, use sight words, and imaginations to complete each task. The journals can be used as morning work, independent writing exercises, writers workshop, or creative writing practice. I have compiled all of the writing prompts for the third grade Treasures reading series into a packet. I will also be sharing the prompts for Unit 6 on TPT. The theme for each week is included along with lines for the students to write their responses to the prompts. Need something to help get through the end of the year blues? Here is a cute and fun writing assignment that students can do! If you download please rate the product and start following me :) Message me if you would like one created for another grade. 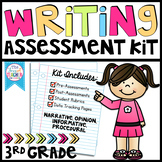 Also included in: 3rd Grade Test Prep Bundle: Aligned to the AIR state tests!